I’m a real believer in mixing high and low pieces. I think it’s much more stylish and also easier on the bank balance, but I do tend to enforce a strict rule on what pieces I spend more money on and what pieces I pick up on the high street. During the summer months, my wardrobe tends to feature more affordable brands, but I find that in the winter a designer or high-end high-street coat (like something from Jigsaw) will last much longer. 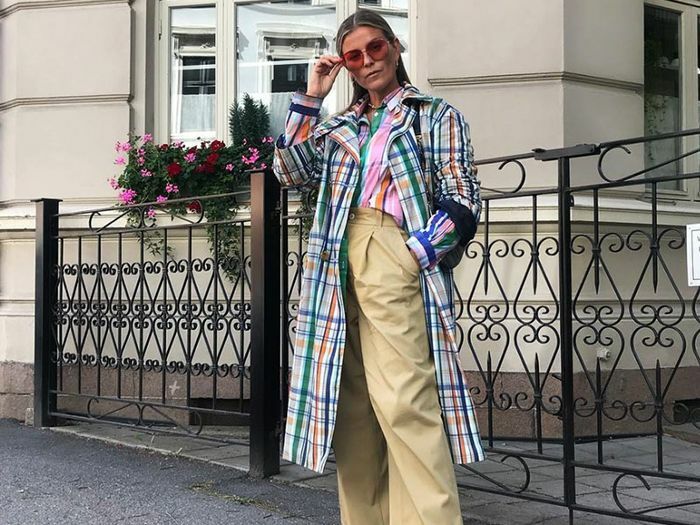 Contemporary designers are also a win for me: Stine Goya and Ganni are two brands that hit that sweet spot financially but deliver better quality pieces (in fashion terms, five Topshop pieces equal one Ganni dress). Rather than going for an on-trend piece that has the potential to date and that you'll get bored of, buy a simpler top-of-the-range high-street item instead. You'll get much more wear out of it in the long run. Keep scrolling to see which pieces I do and don't buy on the high street, and check out my latest looks on Instagram at @emmarosestyle. You can find cute basket bags from independent designers or on the high street. No need to spend a fortune, a vintage basket bag is super stylish. I’m obsessed with Hura’s collection of baskets. I pick up most of my tops on the high street—from H&M's oversized shirts to Topshop's pyjama style blouses. I always find that there’s no need to spend a fortune on a stylish top. You can pick up cool dresses from so many high street stores: H&M, & Other Stories, Topshop and Zara tend to occupy the majority of my dress collection. You can shop for tees on both ends of the spectrum, and I have £10 Topshop tees as well as £100 designer ones. White ones discolour, so probably best to pick up these on the high street. A good-quality black T-shirt can last an age. My affordable go-tos are Topshop, H&M and & Other Stories. For a higher price point I'd recommend ATM, Summa and Victoria Beckham. I do like to buy quality evening shoes. If you buy classic, they'll last you for years. Two that spring to mind that I wear for most of my evenings out are Manolo Blank BB court shoes and Saint Laurent heeled suede sandals. I've had them for years and take to Kelpis (Fulham Road) for some TLC occasionally. I do have a mixture of affordable and designer jeans. You can get some great ones on the high street, but Re/Done, Citizens of Humanity and Rag & Bone are my go-to designers for the longest-lasting and most flattering styles. I've found over the years that high-street styles tend to bobble, so you get more longevity out of a well-made winter coat. Buy sensibly and you'll get it out season after season. The sales are a great time to pick up a designer or more expensive coat for less. Jigsaw, Stella McCartney, Joseph and Anine Bing are my go-tos for for high-quality stylish coats. Not everyone will agree with me on this, but then maybe they've not had the chance tried Eres swimwear! Their strapless costume is a game changer. I bought it on holiday around four years ago (holiday money doesn’t count, does it? ), and it's always the first costume to make it into my suitcase. Choose carefully and go for classic over an It bag if you're going to spend the big bucks. I’ve had my Chanel bag for 10 years, and I'm so glad I invested wisely. Next up, see Emma's perfect capsule wardrobe.